And just like that, the first week is over! It’s almost surreal to be back in marathon training mode, even though it seems like I’m always training for something. Like I outlined in my post about my goals for the next 18 weeks, what I want most is to do this one the right way. That doesn’t necessarily mean I’m wiping the slate clean and starting fresh. It’s the first day of school, but my clothes are still wrinkled and I’m pretty tired, too. The difference is that, at the end of this adventure, I’ll hopefully be a stronger runner with a new PR and a new medal on my wall. And I’ll have had a great experience, too. It’s time to own who I am. Another thing that I love about marathon training is that it’s 18 weeks at a time. I’m excited to see what life will look like 18 weeks later. The Super Bowl was 18 weeks ago– I’ve already forgotten who played. 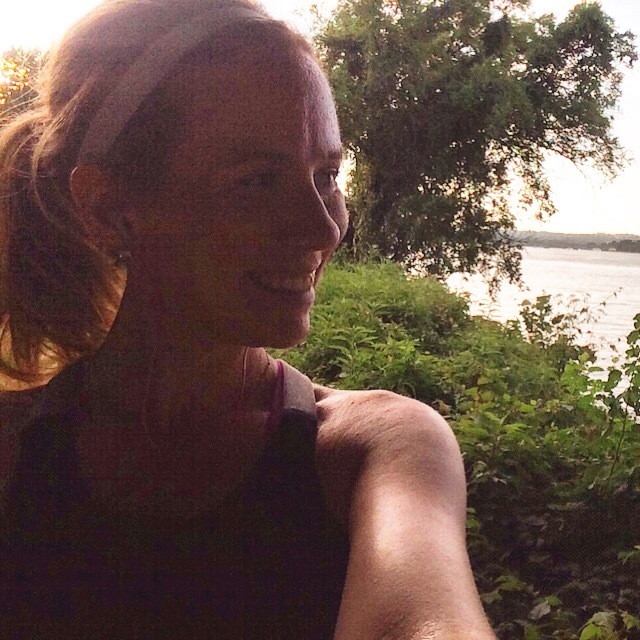 I was training for the United Airlines New York City Half-Marathon 18 weeks ago on a cold weekend in January that now, as I write this and it’s literally a jungle out my window, fleece-lined running pants and headbands seem so long ago. In my personal life, nothing much has changed: still at the same job, still single, didn’t take a cool vacation, but I now have a dog. In 18 weeks, anything can happen, and I’m excited to see what it will be. Monday: 15 minutes of swimming laps (front crawl and breast stroke), 10 minutes of pool-running. 3 sets of 60-second farmers walks, 1:00 full-arm plank, foam-rolling and ITB/TFL stretches. Considering it had rained in the time that I got off work, ran a quick errand at the mall, and got home to walk the dog, I wasn’t even sure I’d be able to go swimming. I had planned 30 minutes, but an extra half-mile walked from the mall plus some strengthening moves made up for the lost five minutes. Eating-wise, it wasn’t the healthiest day— a co-worker had a birthday and she requested milkshakes to celebrate– but I did what I could with my other meals. Lights out at 10:05 for about 8 hours and 53 minutes of shut-eye. Not a bad first day! Turned into a perfect evening! Tuesday: 3 easy-pace miles at 10:18 average. 3 sets x 15 mountain climbers, 3 sets x 15 plyometric jumps, 0:56 full-arm plank, 1:03 wall sit, foam-rolling. With a high around 95 degrees and a heat index of 100 degrees, I knew it was going to be tough to get out there. Luckily, the breeze had picked up quite a bit and it actually didn’t feel that hot. With an easy-pace run, I knew it couldn’t have been that hard anyway. My job today was to specifically run easy. I found myself wondering what “easy run” means. Do I purposely run slow? Is easy defined in terms of effort? I decided to run what felt easy, but when my paces in the last mile started dipping under 10:00, I pulled back on the reigns. Even if running under 10:00 per mile felt easy, it was still my job to run slower today than usual. My walking mileage for the day also got to almost 7 miles, so with about 10 miles traveled on foot, I was exhausted. I got to bed just before 11 for just under 8 hours of sleep. Meal-wise, Tuesday was a hit, but I gotta work on getting to bed in time to log 8-9 hours. Wednesday: 4 medium effort miles at a 9:19 average pace. Full-arm planked for 0:29 while watching Parks and Recreation. The weather today wasn’t as hot as it has been the past several days so getting out for a run wasn’t hard on that level. Because of the reoccurring knot in my calf, however, I was still a little sore from the day before and nervous to run two days in a row. I’ve started warming up by doing knee raises and jumping jacks and my calf killed as I start jumping, but once I started running, I focused on form and the pain shrank into the background. I realized as I was running that I was pushing the pace past race pace, so I had to back down. Not that I was disinterested in speed work or running that fast, but I felt like there’s enough time for that this season. And I’d rather be delighted to find on race day that my goal pace of 9:06 is too easy than push too hard over the season and come nowhere close on race day. Following the run, my legs were seriously sore. I knew I’d have to get a good night’s sleep to rest and repair them, so I went to bed just before 10PM. I only slept, however, from about 10:30 until 1:24 and then again at 5AM until 6:30AM. Insomnia anytime is frustrating; during marathon training, it can be detrimental. Thursday: Unintentional rest day. So, the plan was to complete the Iron Strength Workout for Runners DVD. It was even providential that it arrived the week I started marathon training. I’d have had to wake up early to get it done because I had a happy hour for work that evening and I usually try to start winding down by 8PM, so my window for evening exercise was small. However, a night of insomnia that was definitely unplanned and totally unwanted thwarted my early-to-rise plans. I was awake at 5AM, so I could have gotten out of bed to do the DVD and maybe fallen back to sleep at 6AM for an hour or I could have slept for an hour and still gotten up at 6AM to do the workout, but anyone who has had insomnia understands how miserable it feels. I cut my losses, figuring a) it was the first week, b) I’d been doing a few exercises here and there this week, and c) it wouldn’t sacrifice my mileage count, which I knew I needed to start ramping up. I missed a workout, and in the first week. Not what I wanted, but that’s what I was handed. Moving on. Friday: Rest Day. Ordinarily, if I had to do some switching around of training days, I would do my Iron Strength Workout today since I took a rest day yesterday. I could still do that and feel okay with the balance of my week, but here’s why I chose not to: consistency. Fridays must be my full day of rest during this plan because, with not only Baltimore to train for but * maybe * the Marine Corps Marathon and then the Dopey Challenge 11 weeks later, I am not interested in burning out. I have never done that workout before, so I didn’t want to get sore on it the day before a long run. Even though I slept better Thursday into Friday, I still felt that shattered “haven’t gotten enough sleep” feeling. And Saturday is an early rise day for long runs. That’s just a lot of writing on the wall. Saturday: 6 long run pace miles at a 10:09 average pace. One of the goals I have for this training season is to start waking up early to get my run done. In the past, I sometimes would doubt myself all day Saturday and wait until the last minute to run on Sunday. I just always doubted I was ready to get it done, even if it was a distance I’d run numerous times in the past. I didn’t wake up super early on Saturday to run, partially because I needed the sleep, but also because it was “only” 6 miles. It barely qualified as a long run– as the weeks go by, this distance will eventually be my mid-week medium effort distance. But the day was projected to be in the mid-90’s with a heat index over 100, so if I didn’t get up and get it done, I would pay dearly later. When I started my run at 9:25, it was deceptively cool. Lower 80’s, cloudy, with a cool breeze. Once I started going, it felt like running with a heat blanket on. There was just no cooling off. As for my pace, I felt tired. It felt difficult to run even at a lower pace like that. I just focused on running every mile within my long run pace range, but I couldn’t have run it faster if I’d wanted to. My legs felt tight. First long run of the training season was done; that’s all I wanted out of this one. Glad that one was done! Sunday: 3 easy pace miles at 10:23 average pace. Saturday night into Sunday, I got about 9 hours of deep sleep. I slept until about 9:15, which is late for me, and by that point, all I could think about was getting to the pool. It was supposed to be another scorching hot day: temps in the high 90’s and a heat index well over 100. Since Sunday was also the summer solstice, I decided a late evening run would be more fun! Short run on the longest day of the year. Later that night, around 7:30, I went outside for my run and the world was a literal oven. Temps reached 97 that day and the heat index was 103. That means it would feel like running in 113 degrees. I also couldn’t remember if today was meant to be a race pace day or easy pace day, but the heat sort of made the decision for me. When I started running, my legs felt light and easy. I actually wondered if I could run a pace run. But I decided against it. Even though I had hydration with me, the heat was a major factor as was the trail packed with tourists (ugh, get off the trail if you’re not moving and for goodness sake, don’t move in herds!). I took it slow. My paces were a little high for what I would consider an easy pace run, but I also had to stop and admire the view along the trail. The evening was hazy, the sun was casting a beautiful glow in the sky, and the boats on the Potomac mixed with the Kenny Chesney playlist in my ears made my heart sing. I love summer. I just love love love summer. I felt so grateful it was summer, that I was back in the town I loved where marathon training all began for me, grateful for the opportunity to run and train. I wouldn’t have wanted to fly through that. Sometimes running is about slowing down and seeing the world. A perfect run to end a perfect day and a perfect first week of training! Recap: With the exception of a missed strength/core workout, I’m very satisfied with having met each of my pace and distance goals for this week. I got all 16 miles run and I incorporated enough strength and core work to help manage the knot in my calf. I tried to strike a balance of getting in a good amount of miles to prepare for the ramp up that occurs in marathon training while also respecting the rest I needed coming out of a busy spring. I need to work on better eating and sleeping habits for next week, but with 17 weeks left before the race, there’s a lot of room for improvement. Next week will be a ramp up in mileage– 20 miles!– plus the start of my Iron Strength Workout program. But I’m confident that this week prepared me well enough to step to the plate. It’s going to be a good season.